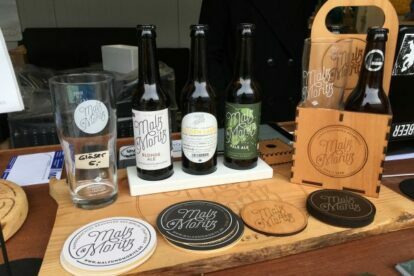 A local gem of the Berlin craft beer scene is called Malz & Moritz. A true microbrewery, they brew their beer in batches of only 1,000 liters. It all started with three friends who experimented with brewing during their university studies. Being engineers, they modified a washing machine (can you believe it?!) for their first couple of brews and quickly built larger facilities first with a capacity of 30 liters, then 200 liters. In 2015, they officially founded Malz & Moritz and set up in an industrial park at the south-west tip of Berlin, where they hand-built a professional brewing facility. Their Pale Ale and Blonde Ale have found their way into many restaurants and delicatessen stores in Berlin, most notably the KaDeWe gourmet food hall – the crowning glory for any high-quality food or drinks producer. If you are planning a party, you might consider stocking up on beer there – they offer personalised labels, so you could brand your beer as a treat! Their shop is in a building called “Goerzwerk”, a startup hub in the south of Berlin.